17 3/4 inch 8 day chalet with many moving features. Turning dancing couples in traditional Black Forest attire. Moving water wheel in side addition with shingle roof & 2 moving wood sawers. 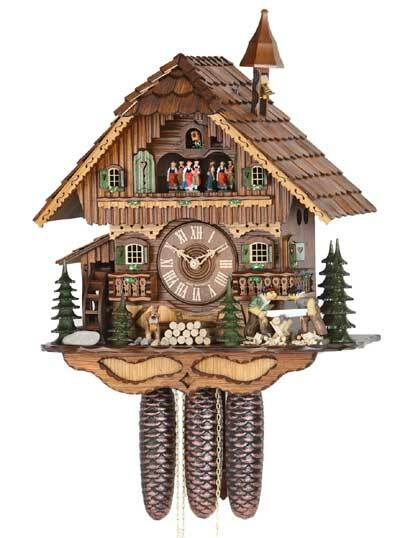 Many decorative details.Clock features roof with over 100 handcut and handlaid wooden shingles. 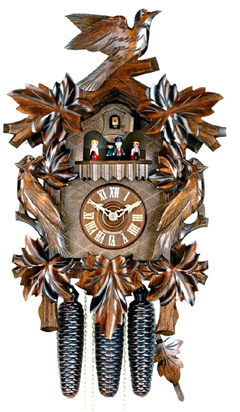 Light wood trim adds nice accents to the clock. Lasercut windows and green shutters. Wooden hands, dial and cuckoo bird & St. Bernard Dog. Big bellows create deep cuckoo call.